Back in March, thousands of people descended on New Plymouth and many locals were preparing for the three day musical and cultural extravaganza that is WOMAD. 2018 is the fifteenth year of the Todd WOMAD partnership, and also 15 years since WOMAD came to Taranaki. The festivities kicked off early for us; the excitement beginning with our WOMAD community programme. This programme gives school children the chance to attend music and dance workshops hosted by WOMAD artists. For the first time, Todd was able to bring a slice of WOMAD to the children of South Taranaki as well as running the workshops in North Taranaki for the ninth year, where the event is already a highlight of their school calendar. The children and teachers commented on how much they enjoyed the unique opportunity the workshops provide and how much fun the day was for all involved. This year, the children of Tikorangi primary challenged themselves through music, song, and also language. Chilean artist Nano Stern guided the students through a Spanish song, which they later performed to other students and community members. In South Taranaki, Kaponga and St Patrick’s primary explored harmony and humour lead by Australian artists The Spooky Men’s Chorale. 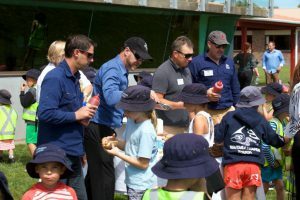 This was the first year students from South Taranaki were able to participate in these workshops after our acquisition of the Kapuni Production Station in August 2017. We look forward to sharing this event and many more like it with the residents of South Taranaki now that we have taken on operatorship. Todd was also lucky enough to participate in the artist Powhiri at Owae Marae. This was a truly special event and a coming together of cultures through song and dance. We walked away in awe of the incredible talent and richness of cultures. Artists shared their backgrounds and provided insights into the sometimes challenging roads taken in order to follow their artistic passions. It was a mesmerising experience. The event certainly delivered on its accolade of ‘Best National Event of the Year’, with this year’s festivities being labelled as one of the best yet. Ticket sales were also one of the highest in the events history, with a completely sold out Saturday putting the site at capacity with 12,500 audience members and 17,000 people in total (including all of the workers, artists and vendors). The WOMAD new-comer also managed to call out ‘the Hungarian fry bread’ as a highlight and the moment the Lemon Bucket Orchestra finished their Saturday night set in the middle of the crowd – and we’d have to agree with her. Dates for the 2019 festival have been announced as 15-17 March, and more details will be revealed on the WOMAD website in the coming months – needless to say we here at Todd are already looking forward to the 2019 festivities.